GlobTek has updated Korean KC Certificates and reports for 24V members of the GT-41080 Series to the latest published standard K 60950-1(2.0)(2011-12). The KC Certificate is required for power supplies to be sold in Korea on their own or as part of a system according to the Electrical Appliances Safety Certificate Act which enforces that all electrical appliances must obtain safety certificate for manufacturing and selling. The system also audits the certified manufacturer for producing the products in compliance with the terms and conditions of the certificate on stable and continuous basis to protect the users from electric shock, fire or other risks which may be caused by nonconforming product. The miniature ITE(60950-1) universal input switching power supply model is available in Class II, 2 Prong, interchangeable blade configurations. 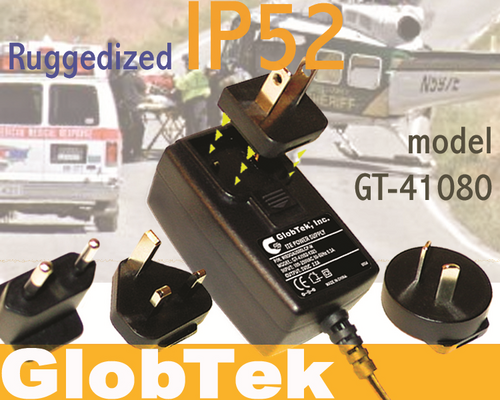 GlobTek's changeable input blade system has individual field replaceable input plugs for North America/Japan, Europe, United Kingdom, Australia and New Zealand, China, Korea, Argentina, India, Brazil, and also an IEC320 type configuration. The power supply has an input from 90-264VAC 50-60Hz and a factory configurable output of 5VDC to 48VDC output with a max power of 18W continuous output. This product complies with North American Energy Star, Canadian NRCAN, and other worldwide requirements for Level V efficiency compliance and is produced in an ISO13485 certified facility. This family features regulated output with very low ripple, Built-in over current, Short circuit, Over current, and thermal protection as well as low leakage, low ripple, and high efficiency. The product is suitable for most applications requiring DC power and common applications include medical devices, portable medical treatment and monitoring equipment and instruments, Hospital equipment and fixtures, equipment, and as a power source for Li-Ion battery chargers. Customized enclosure colors, housing designs, output cord types and lengths, as well as customized packaging available upon request.